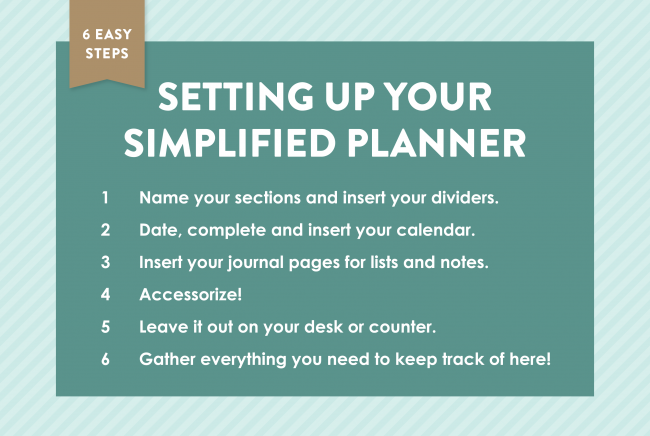 Setting Up Your Simplified Planner! 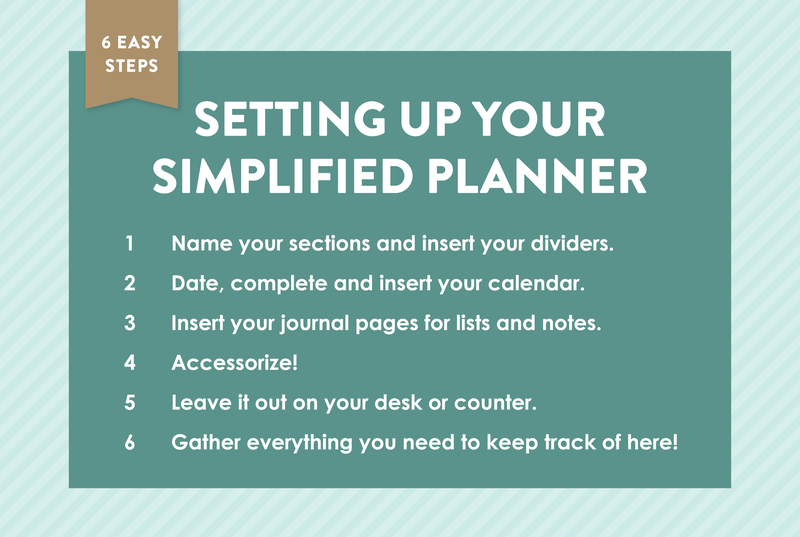 We’ve sold so many Simplified Planners over the past few days and months, I thought it might be a good time to give our suggestions for how to set yours up when it arrives! 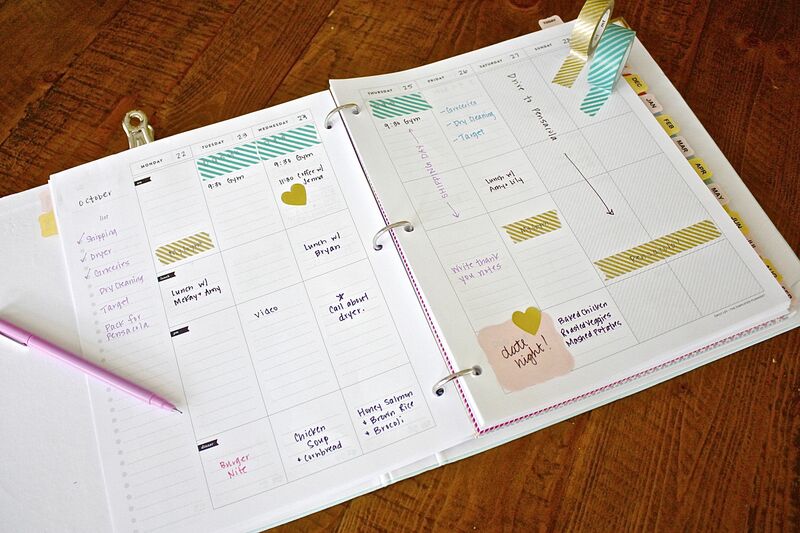 We are officially sold out of our Turquoise Simplified Planners but have Warm Pink and Tan Linen in stock! We expect these to go quickly over the next few weeks as 2013 approaches, so grab your now HERE. FIRST, decide the names of your sections. Ask yourself this question: What are the SIX most important areas of my life that need my attention? These may change over time, which is why we offer the Divider Sets seperately should you ever need to change one. Using my DYMO Label Maker and clear label tape, I created names for my dividers including: CALENDAR, TO-DO, BRADY, HOME, WORK and BLOG. I suggest making your calendar the very first piece of your planner and keeping it at the very front. SECOND, date, insert and fill out your Calendar as completely as possible with birthdays, appointments, reminders and important dates. THIRD, insert your Journal Pages for lists and notes within each section. Remember, you can punch holes in any papers you want to keep in your planner and pop them right in. The Journal Pages give you a place to brain-dump your thoughts for each important area of your life. Out of your head and into your planner. Make room in your head for what matters. The next step is one of my most favorites. FOURTH, ACCESSORIZE! Our favorite accessories are Martha Stewart / Avery at Staples and Target Up & Up! From Binder Bands to clip in post-it holders to big clips to hold coupons / receipts / etc at the front of your binder (like I do [see photo above]) they have it all! The monthly tabs you see in my planner were made with these MS stick-on tabs and my DYMO label maker! Here’s a printable coupon for 40% off one Martha Stewart item at Staples! FIFTH, and this is VERY IMPORTANT… leave it OUT. 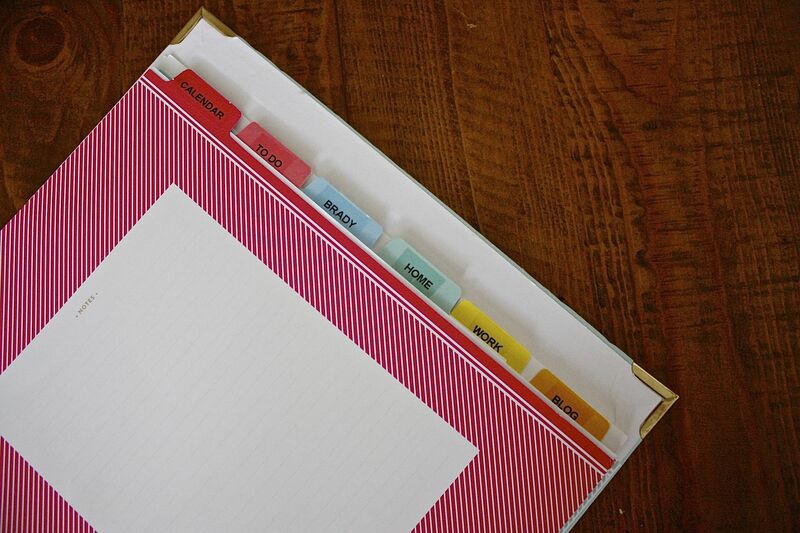 The reason most planners FAIL to keep you organized is because they’re not left OUT and OPEN on your desk or counter. SIXTH, DUMP everything out of your brain into this planner. 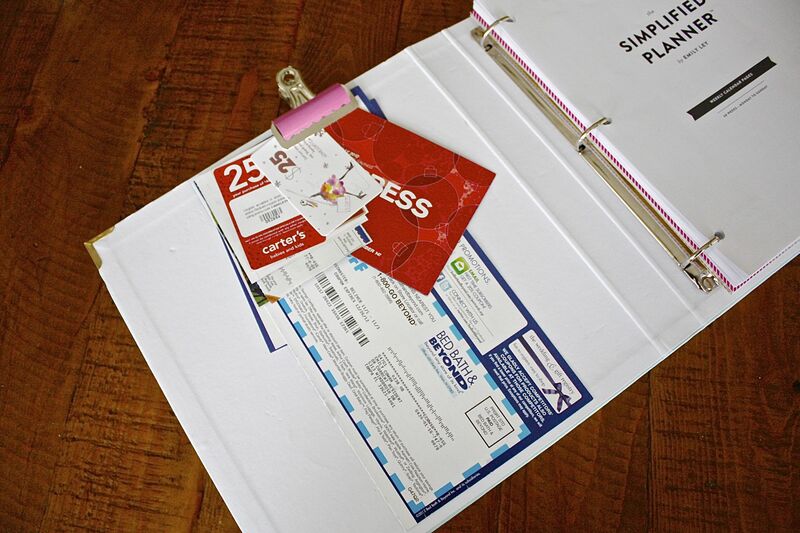 Put ALL the pieces of paper you need to keep (receipts, to-dos, grocery lists, reminders, important school notes, ANYTHING that floats around your home / office that you need to keep up with) HERE. Get it out of your head and off your desk so you can focus on what really matters. This is a little Christmas Card from my family to yours. Thank you for making this year incredible. Thank you for supporting our little shop in its very first year open. As our gift to you, we’d like to offer you free shipping on all orders over $50 (including the Simplified Planner Starter Kit) from now until Christmas. 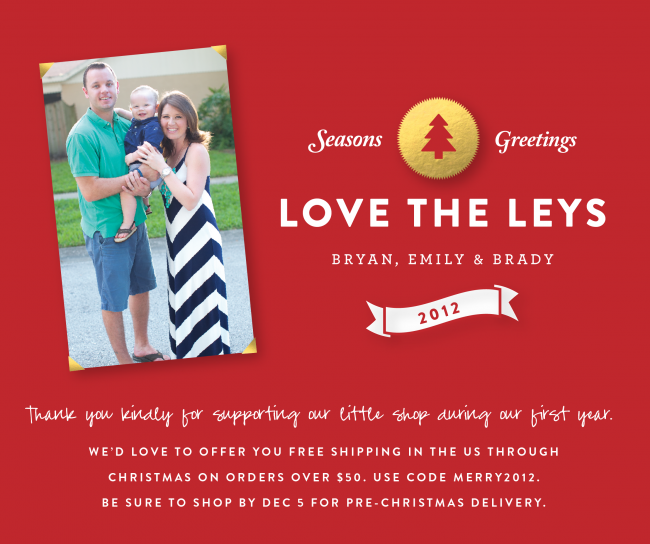 Remember, all orders must be placed by Dec 5 in order to be received pre-Christmas. PS: If you have a minute, watch this sweet video. Brady’s cheese-face is my absolute favorite part.